Hands down the best things about winter food, I feel, is soup. And alternatively, the best thing summer foods have to offer has got to be salad. But seeing as we are beginning our blog adventure in the colder months, I am going to bring you a series of my favourite tried and tested soups. I will often make a big pot on Sunday afternoons for dinner that night and left-overs for lunches the following days. Most of my soup recipes are large in size. So, especially with this one, if you don’t have a big pot or just cannot stomach that much soup, then halve the recipe. A form of this recipe was originally my Aunty Sue’s, then my Mum used to cook this a lot, and I have cooked it every winter since I was a teenager. I have added a bunch of stuff, so it’s probably not too similar to the original version- but the Indian flavours and chunky sentiment are still there. This soup is super healthy and I often use it as my go-to winter detox. (Obviously the detox version would not involve the garlic bread and red wine as seen in the picture below.) It’s packed with flavour and ridiculously filling so it doesn’t feel too much like diet food. Hope you enjoy. 1. Preheat oven to 200 degrees. Line 2 baking trays with baking paper. Add chopped cauliflower, one slurp of oil and half of the cumin, garam masala, tumeric and coriander powder. Stir together and then spread out evenly on the tray. On the other tray, add the chopped fresh tomatoes, season with salt and pepper and spread out evenly. Put both trays in the oven, baking until the cauliflower is golden brown and the tomatoes are juicy and losing shape. This will take up to half an hour depending on the oven. 2. Meanwhile, add the other 2 generous slurps of olive oil to a very large saucepan and heat on medium heat stove-top. Once hot, add the onions, garlic and mustard seeds. Cook, stirring until the onion is clearing, the mustard seeds are popping and the garlic is golden- roughly 10 minutes. Then, add the mixed beans and the remaining cumin, garam masala, tumeric, coriander powder and curry powder and stir for another 5 minutes. 3. Try one of the beans to make sure they have softened slightly. 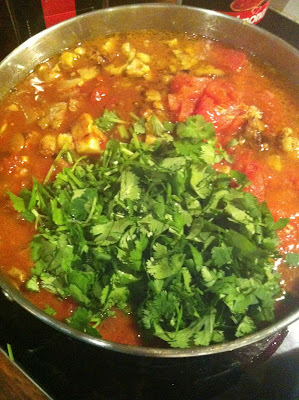 Then add the 2 cans of crushed tomatoes, 750ml of the vegetable stock, and most of the coriander bunch, including stems (save some fresh coriander for garnishes). Bring to a simmer. 4. Check the cauliflower and tomatoes; once they are ready add them to the pot and stir. It is important to taste, season with pepper and salt, and add a touch more curry powder for stronger Indian flavour. The extra stock is to make the soup thinner if you wish. Put the lid on the pot, bring the heat right down and allow to cook for an extra 15 minutes. 5. Serve with a generous dollop of natural yoghurt, left-over fresh coriander, pepper and salt and garlic bread.